At MIPR Corp, we have a custom conveyor belts for everything. It’s true! No matter what you are trying to transport, sort, heat, cool, or produce, MIPR Corp carries the perfect belt to keep your business moving forward. Many conveyor belt companies carry only the most popular belting types and don’t have our level of hands-on experience with more specialized conveyor belt materials and options, such as bakery belts or metal mesh belts. In fact, if you call another supplier looking for a high-temperature belt, food belt, or a Teflon glass belt, there’s an excellent chance that they will call us to find it. It happens all the time. For over 40 years, we have specialized in conveyor belts for a wide range of applications and industries. And we mean every type of belt ( heavy industrial, light industrial, rubber, rough top, cleated, and more) for every possible application (paper mill, aggregate, recycling, wood, steel, aluminum, food, packaging, and more). Smart solutions, wide-ranging regulatory expertise, and our quick-ship sample policy solve critical problems and minimize downtime for our customers every day. We regularly field calls from all across the country to repair, customize, ship, or install custom conveyor belts. Pick yours, and we will send you a physical sample today! Cleated Belts configured to elevate and move any kind of item, from FDA-approved food-grade belting to rugged, heavy-duty industrial belts. Cleated belts are also great for mining and construction. Filter Belts for critical waste treatment and dewatering applications and Metal Mesh Belts for flow-through, baking, heat, and conveying. Light Industrial Belting for lumber, bulk material handling, heating and cooling, luggage handling, and more! Rough Top Belting to minimize impact and vibrations and provide friction for inclines and declines. Have you been putting off a conveyor belt fix or putting up with subpar performance because you think no belt can do better? Our experts can take a look at your challenge, provide a free estimate, and ship you a sample today! What your conveyor belt needs to carry. It’s helpful to have images, material types, and size, weight, and bulk dimensions for your products. And if you need a multi-purpose belt able to carry more than one type of product, make sure we know about them all. The more detailed you can be, the better we can customize your conveyor belt. Cell phone pictures help, too, and can be shared by email or text. How your production process works. Where is your belt going—indoors or outdoors? Are there inclines and declines and, if so, at what angles? Temperature changes? Size of elemental pulleys? How do you feed your belt and what equipment do you use to feed it? Your goals for rate requirements. By sharing your metrics and product travel speed as well as the weight and volume of your products, you help our experts make energy efficient motor suggestions. Bells and whistles. Our team is able to add safety guards, covers, metal detection and more. If you’ve ever wished your belt could do more, now is the time to ask. Let us send you a physical sample today! 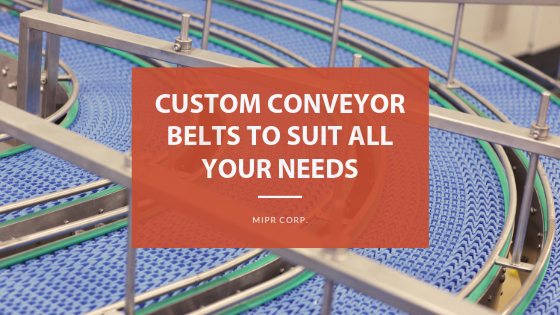 Even our competitors call MIPR Corp for custom conveyor belt advice. So go ahead—try to stump us! Our belting experts are always standing by, ready to answer your conveyor belt questions and set up smart conveyor belt solutions—and we offer same-day shipping guarantee on all our samples.